Betty Jane Spilman is the daughter of Donald Walter Spilman and Doris Alice Harn. Betty Jane Spilman married Gary Thompson, son of Jim Thompson and Marion Aarsvold, on 2 August 1969 at Christ the King Lutheran Church, Byron, Olmsted Co., Minnesota. 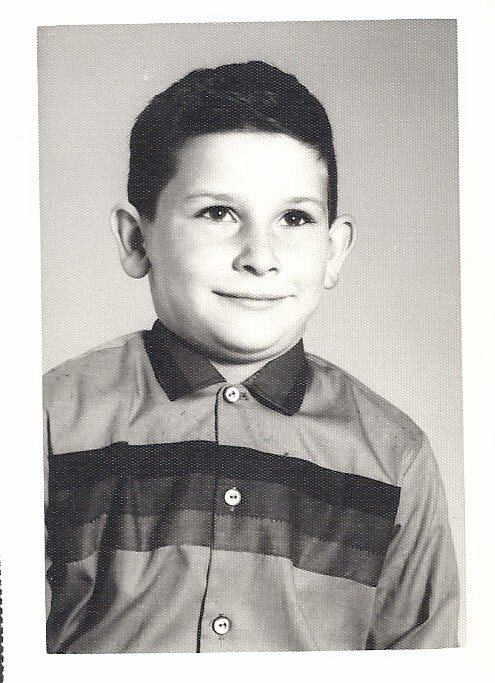 Daniel George Spilman was born on 23 July 1952 at Mrs. Howe's Maternity Home, Dodge Center, Dodge Co., Minnesota. He was the son of Donald Walter Spilman and Doris Alice Harn. Daniel George Spilman married Jean E. Robb, daughter of Everett Robb and Carol (? ), on 14 December 1974; SOURCE: Dan Spilman letter 9/1996. Daniel George Spilman and Jean E. Robb were divorced in August 1990. Daniel George Spilman married Kimberly Sue Kauffmann, daughter of Richard Kauffmann and Marilyn Jacobsen, on 23 June 1991 at Colorado; SOURCE: Dan Spilman letter 9/1996. Daniel George Spilman died on 3 October 1998 at Minnesota at age 46. He was buried at Evergreen Cemetery, Mantorville, Dodge Co., Minnesota; Plot: 609 A.
Daniel George Spilman was a performed construction work and raced cars for several years. His Social Security Number was 468-60-8170 issued in Minnesota. He lived at 603 1st Ave NW, Kasson, Dodge Co., Minnesota. SOURCE: Doris Spilman 2/1991. SOURCE: Doris Spilman letter 10/1991. Davey Harn Spilman was born on 30 June 1955 at Dodge Center, Dodge Co., Minnesota. He was the son of Donald Walter Spilman and Doris Alice Harn. Davey Harn Spilman died on 7 June 1972 at Dodge Center, Dodge Co., Minnesota, at age 16. He was buried in June 1972 at Evergreen Cemetery, Mantorville, Dodge Co., Minnesota; Plot: C.
The cause of death was chronic acute liver disease, ill for 4 years. Davey died while waiting for a liver transplant donor. SOURCE: Doris Spilman. 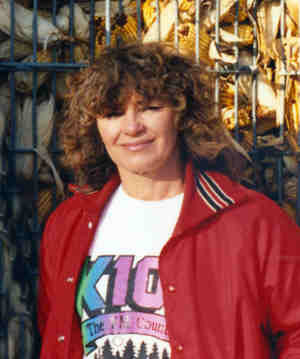 Carole Ann Harn was a Housewife, farmer. Her married name was Bongers. SOURCE: Carole Bongers. Carole Ann Harn was a Catholic. Tony and Carole own and operate Rainbow's End Farm in Faribault. They provide tours of their farm with all the exotic animals. As of 2002, they have ostrich, emu, Rhea Peacocks, peasants, pigeons, llamas, mini-burrow, horses, mini-goats, milk goats, chickens, ducks, rabbits, potbelly pigs, chinchillas, hedgehog, ferret, cockatiels, love birds, finch, parakeet, hamster, hermit crab and a couple aquariums full of fish.2 She lived in 2009 at 15364 Cabot Ave., Faribault, Rice Co., Minnesota. FARIBAULT — Carole (Mrs. Tony) Bongers, age 64, of Faribault, died on Sunday, Dec. 6, 2009, at her home. Memorial services were postponed and will be held Thursday, Dec. 10 at 2 p.m. in the Boldt Funeral Home, Faribault, with Chris Sorensen, pastoral minister of Divine Mercy Catholic Church, Faribault, officiating. Interment will be held at Meadow Ridge Memorial Park, Faribault. A memorial visitation will be held in the Boldt Funeral Home, Faribault, on Tuesday from 4 to 8 p.m. and also for one hour prior to the Thursday services. Updated: Fri Aug 17, 2012. Robert "Bob" Harn, age 65, of Faribault, died on Wednesday, August 15, 2012 at his home. Memorial services will be held at the Boldt Funeral Home, Faribault, on Tuesday, August 21, 2012 at 10:30 a.m. Interment will be at Calvary Cemetery, Faribault. Memorial visitation will be at the Boldt Funeral Home for one hour prior to the service on Tuesday. Robert David, the son of David and Celia (Stasney) Harn, was born December 1, 1946 in Faribault. He attended Faribault High School. Bob served in the U.S. Navy and was later employed at McQuay's of Faribault for over 40 years. [S135] Interview with Celia Marie (Stasney) Harn (1104 West Division St., Faribault, MN 55021), by Steven Harn Redman. Steven Harn Redman (2633 N. 1600 E., Layton, Davis Co., UT). [S2045] Robert "Bob" Harn, Faribault, Faribault Daily Newspaper, Minnesota, http://www.southernminn.com/faribault_daily_news/obituaries/article_5ab705af-065f-5e69-910c-63f691b77573.html, 17 Aug 2012. Hereinafter cited as Faribaut Daily News. Laurence Michael Harn is the son of David Marshall Harn and Celia Marie Stasney. 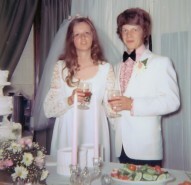 Laurence Michael Harn married Julie (Judy) Ann Jasinski, daughter of Jerome David Jasinski and JoAnn Popelka, on 6 September 1975 at Faribault, Rice Co., Minnesota. Laurence Michael Harn and Julie (Judy) Ann Jasinski were divorced circa 2006 at Rice Co., Minnesota. Linda Marie Harn was born on 24 June 1952 at Faribault, Rice Co., Minnesota. She was the daughter of William Oscar Harn and Donna Ann McCarthy. Linda Marie Harn was baptized at Immaculate Conception Catholic Church, Faribault, Rice Co., Minnesota. She married Stephen Arthur Gray, son of Methodius Kenneth Gray and Gloria Mae Sorenson, on 14 July 1973 at Faribault, Rice Co., Minnesota. Linda Marie Harn died on 29 May 2016 at 15041 Judicial Road, Burnsville, Dakota Co., Minnesota, at age 63.
lindagray52@gmail.com in January 2016. She lived in April 2016 at 15041 Judicial Road, Burnsville, Dakota Co., Minnesota. [S1703] Linda M. (Harn) Gray, "Email from Linda Gray 15 Mar 2006," e-mail message from e-mail address (n/a) to Steven Harn Redman, 15 Mar 2006. Hereinafter cited as "Email from Linda Gray 15 Mar 2006." Judy Ann Harn is the daughter of William Oscar Harn and Donna Ann McCarthy. Judy Ann Harn married Dennis Myron Anderson, son of Curtis Myron Anderson and Geraldine Jacqueline Polfus, on 25 May 1979 at Ft. Snelling Memorial Chapel, Hennepin Co., Minnesota. [S1970] Minnesota Official Marriage System, online http://www.mncounty.com/Modules/Certificates/Marriage/Default.aspx, Marriage Certificate 09111328 (Eve's last name listed as Flohrs). Hereinafter cited as Minnesota Official Marriage System. 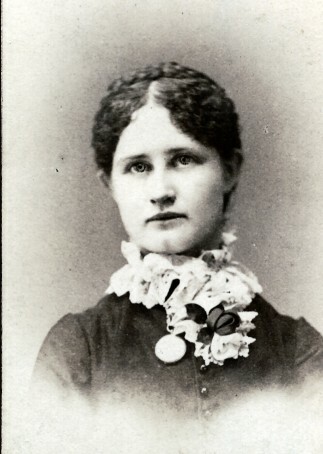 Kathleen Maria Harn is the daughter of William Oscar Harn and Donna Ann McCarthy. Kathleen Maria Harn married Joseph Edmund Sherman, son of Edmund Paul Sherman and Agatha Magdelena Kern, on 1 May 1987 at Faribault, Rice Co., Minnesota. Kristine Rose Harn is the daughter of William Oscar Harn and Donna Ann McCarthy. Kristine Rose Harn married John Morelan Brandenburg, son of Gerald Jerome Brandenburg and Mavis Ordell Halverson, on 16 November 1992 at Grand Marais, Cook Co., Minnesota. Kristine Rose Harn and John Morelan Brandenburg were divorced circa 2008. Stephen Arthur Gray is the son of Methodius Kenneth Gray and Gloria Mae Sorenson. Stephen Arthur Gray married Linda Marie Harn, daughter of William Oscar Harn and Donna Ann McCarthy, on 14 July 1973 at Faribault, Rice Co., Minnesota. Dennis Myron Anderson is the son of Curtis Myron Anderson and Geraldine Jacqueline Polfus. Dennis Myron Anderson married female (?) Dennis Myron Anderson married Judy Ann Harn, daughter of William Oscar Harn and Donna Ann McCarthy, on 25 May 1979 at Ft. Snelling Memorial Chapel, Hennepin Co., Minnesota. Kevin James McCarthy is the son of Edward James McCarthy and Joan Louise Kukowski. Kevin James McCarthy married Lisa Ann Laboda, daughter of Leslie Orin Laboda and Margery Ann Domagala, on 5 May 1990 at Lake Elmo, Washington Co., Minnesota.1 Kevin James McCarthy and Lisa Ann Laboda were divorced. Kurt McCarthy during Christmas 1976. Kurt Edward McCarthy was born on 14 January 1973 at St. Paul, Ramsey Co., Minnesota. He was the son of Edward James McCarthy and Joan Louise Kukowski. Kurt Edward McCarthy died on 16 July 1995 at Ramsey Co., Minnesota, at age 22. He was buried on 20 July 1995 at Guardian Angel Cemetery, Oakdale, Washington Co., Minnesota. The cause of death was Kurt was born 3 months premature, and had numerous complications. He was never married. SOURCE: Joan McCarthy 02Jun1992. His Social Security Number was 473-90-0722 issued in 1978. Social Security Death Index lists death as 15 Jul 1995. Patricia Ann Lien is the daughter of Lloyd Alexander Lien and Geraldine Marie McCarthy. Patricia Ann Lien married Duane Joseph Nerud, son of Myles Benjamin Nerud and Jane Marie Swenson, on 15 January 1977 at Faribault, Rice Co., Minnesota. Michael Alexander Lien is the son of Lloyd Alexander Lien and Geraldine Marie McCarthy. David William Lien is the son of Lloyd Alexander Lien and Geraldine Marie McCarthy. James Andrew Lien is the son of Lloyd Alexander Lien and Geraldine Marie McCarthy. Lisia Katherine Lien is the daughter of Lloyd Alexander Lien and Geraldine Marie McCarthy. Lisia Katherine Lien married Richard Allen Rhoades, son of Richard Allen Rhoades and Margaret Lynn (? ), on 13 August 1994 at 1st English Lutheran Church, Faribault, Rice Co., Minnesota. Duane Joseph Nerud is the son of Myles Benjamin Nerud and Jane Marie Swenson. Duane Joseph Nerud married Patricia Ann Lien, daughter of Lloyd Alexander Lien and Geraldine Marie McCarthy, on 15 January 1977 at Faribault, Rice Co., Minnesota. 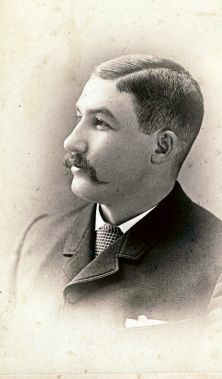 Herbert E. Harn on 17 Mar 1889 in Mason City, Iowa. Herbert Elden Harn was born on 17 March 1860 at St. Anthony Falls, Hennepin Co., Minnesota.1 He was the son of Calvin Davis Harn and Rachel Ruple (Rupel). Herbert Elden Harn married Alice M. Sackett, daughter of Simon Sackett and Elizabeth Bawman, on 17 March 1885 at Janesville, Waseca Co., Minnesota.2 Herbert Elden Harn died on 15 April 1931 at 4221 Crocker Ave., Morningside, Hennepin Co., Minnesota, at age 71.1 He was buried on 18 April 1931 at Lakewood, Hennepin Co., Minnesota. HARN, Herbert E. born March 1860, 40-years old, married 15 years, renting house at 610 West Fifth Street, occupation listed as R.R. Conductor. 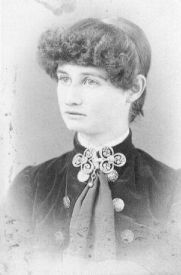 HARN, Ellis S., wife, born on April 1863 in MN, 37-years old, father born in New York and mother born in Kentucky. Has had only one child. Census 1900 Winona, Winona Co., Minnesota, E.D. 195, sheet 5. Street Address: 313 N. Washington Ave. Her married name was Streeter. The cause of death was hung self after husband left her. HARN Family Bible. Unable to locate Death Certificate in Rice Co., MN. 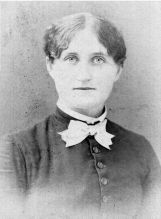 Resident of Rice Co., MN when married. Census 29 April 1910 Nunn, Weld Co., Colorado, Jessie listed as widowed, enumerated with her sister Mary. [S141] Jessie Gertrude Harn cemetery marker; unknown reader. 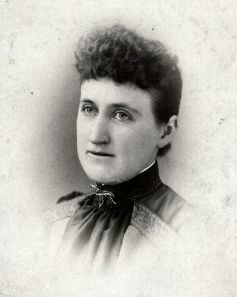 Mary C. Harn taken in Red Wing, Minnesota. 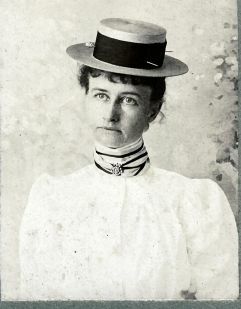 Picture of Mary C. Harn date 1902. Census 29 April 1910 Nunn Pct 46, Weld Co., Colorado, Enumerated with her sister Jessie. Original data: Original sources vary according to directory. The title of the specific directory being viewed is listed at the top of the image viewer page. Check the directory title page image for full title and publication information. Hereinafter cited as U.S. City Directories, 1821-1989 (Beta). Occupation: Opr., Postal Tel-Cable Co. Source Citation: Year: 1940; Census Place: San Diego, San Diego, California; Roll: T627_450; Page: 8B; Enumeration District: 62-138. 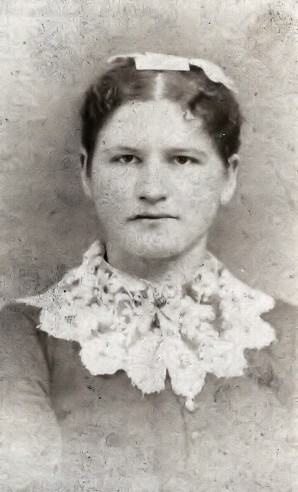 Annie K. Harn taken 13 Dec 1889 in Faribault, Minnesota, when 21 years old. 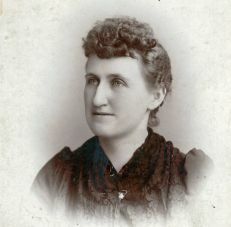 Annie K. Harn taken in Spokane, Washington. 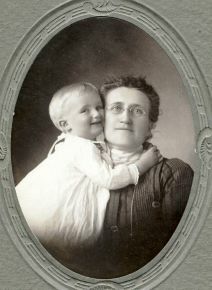 Annie K. Harn Sells and her son, Jonn Kenneth Sells at age 20 months, taken in Denver, Colorado. NOTE: This was the same address listed for her father Calvin D. Harn in 1889-1890. Her married name was Sells. The following obituary is from The Lompoc Record newspaper (California), 20 Nov 1947. Final rites were conducted on Sunday for Mrs. Annie Harn Sells, long-time Lompoc resident who passed away Friday in the Lompoc Community Hospital. The funeral was held in the Starbuck chapel with Rev. O.J. Hoag officiating, and the Order of Eastern Star participating. Internment followed in Evergreen cemetery. 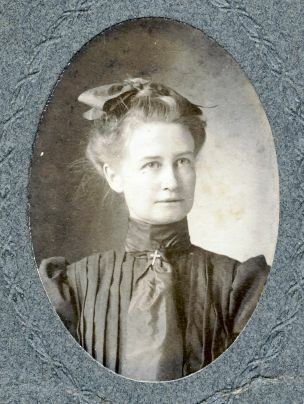 Mrs. Sells was a native of Faribault, Minn., where she was born on July 31, 1868. 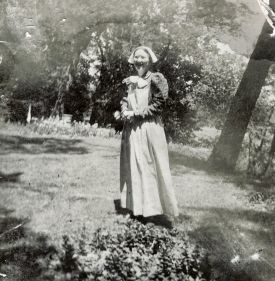 She came to Lompoc in 1918 with her husband, John Sells, who was employed with the Celite company. The deceased leaves her husband, a resident of Lompoc, now retired, and a son, Col. John K. Sells who is at present stationed at Nashville, Tenn. She also leaves two granddaughters, Ann Caroline and Sonia Ellis Sells, who reside in Santa Fe, N.M., and a brother and sister, Harry R. Harn of Chicago and Mary C. Harn of San Diego. Mrs. Sells was active in the Eastern Star organization in Lompoc and was a member of the White Shrine. Pall bearers for the funeral were Ray Stalker, D.D. MacArthur, Alex Main, Frank Jenks, Glenn Rohlfsen and Milburn Pickner. [S142] Annie Kezia(h) (Harn) Sells, Death unknown number, unknown repository, unknown repository address. [S2292] Find a Grave Inc., Find a Grave, database and images (: accessed Mar 2014), Annie Harn Sells (1868-1947) gravestone photograph, memorial no. 17061632, Evergreen Cemetery, Lompoc, Santa Barbara Co., California, photograph © Lois, 2014. Eunice Purdy was born on 17 April 1765.1 She married Ebenezer Purdy, son of Jonathan Purdy and Charity Hadden, on 29 December 1788. Margaretta H. Harn taken in Minneapolis, Minnesota. Picture from top to bottom: Jessey Remmey, Alice Butler, Olive Hallock, Biss Beach, Mable Pierce, Maggie H. Harn, taken in Faribault, Minnesota. Margaretta Harn taken at Cedar Lake, just outside of Faribault, Minnesota. 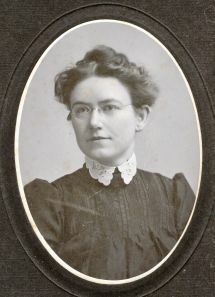 Margaretta Helen Harn was a School-teacher. Her married name was VanSickle. 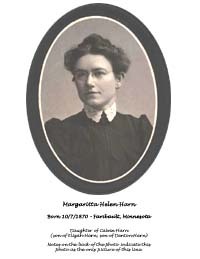 Margaretta Helen Harn also went by the name of Maggie. Marriage record was filed on 11Feb1909. The cause of death was died 3-days after giving birth to her son. In a letter dated 20Feb1910, possibly from Ann Sells, it states that Maggie was married 04Feb1909. Also that she had been in a runaway the previous summer, and was possibly hurt internally. Was unable to locate George and Maggie in the 1920 Soundex.